The AgSterilized technology, is incorporated into products as an additive at the time of manufacture, or applied as a coating after manufacture. Once incorporated the antimicrobial additives provide long lasting built-in microbial protection for the expected lifetime of the product. 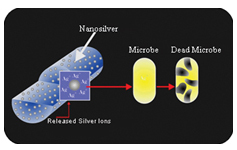 With AgSterilized technology, the silver ions comes in contact with microbes present on material surface to destroy them by disrupting their normal cell function in turn inhibit their reproduction and finally results in the death of the cell. It inhibits the microbial growth by three different modes of action. 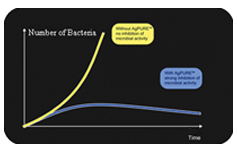 Make conditions unfavorable for microbial growth: Less colonies, poor growth conditions. Blocks Microbial Cell Metabolism: Results in microbial death. Binds with sulphur containing amino acids: Destroy proteins, DNA/RNA. Tests have revealed that our nanosilver inhibits growth of bacteria within seconds. For application like antimicrobial coatings and protective clothing fast inhibition of bacteria is required. AgSterilized is incorporated into the substrate material (e.g., polymer or coating) and is therefore irreversibly immobilized. The antimicrobial effect does not decrease over time even when the treated product is exposed to UV-light or subjected to harsh cleaning procedures. release over the life time without any decrease in antimicrobial activity. recommended antimicrobial agent in microfiber production. Our nano silver is safe and free from any adulterants and non toxic in nature.